As opposed to the Chromecast, which doesn't have any UI or controls of its own, the Fire TV stick has most of the functionality of a standard media set-top box. It's running Fire OS 5, a fork of Android 5.0 Lollipop, and can play content from all your standard online services. The major omission is any Google services, like YouTube or Google Play Movies (probably because of this). Still, if you're looking for a self-contained media box with Alexa built-in, the Fire TV Stick isn't a bad choice. You can get it from Amazon here, but customers in the UK, Germany, and Japan can only pre-order it for now. For those countries, you can expect it to ship starting in April. SEATTLE--(BUSINESS WIRE)--Feb. 21, 2017-- (NASDAQ: AMZN) – Amazon has announced that the latest generation Amazon Fire TV Stick is now available for customers in the UK, Germany, and Japan. Read the press release announcing Fire TV Stick with Alexa Voice Remote in the UK: www.amazon.co.uk/pr, Germany: www.amazon-presse.de, and the Fire TV Stick with Voice Remote in Japan: www.amazon.co.jp/press. The all-new Fire TV Stick is 30 percent faster than the previous best-selling version, has a powerful quad-core processor for streaming high-quality video, and offers access to thousands of apps, games, movies, and TV shows. Customers in the UK and Germany can also use the included Alexa Voice Remote to get the news and weather, check their commute, get sports scores, create shopping lists, play music, and more. With the included voice remote, customers in Japan can use their voice to search for their favorite programming and control playback of Amazon Video content. With the new Fire TV Stick, customers have access to a completely redesigned interface that makes finding what to watch even easier and more enjoyable. Fire TV Stick offers a new cinematic experience, delivering video trailers and content screenshots to help customers access the content they want. Fire TV also shows you the best viewing options – stream, rent, or buy – to help you choose content based on convenience and value. Finding and enjoying apps and games is also easy with a customizable app list on the home screen. 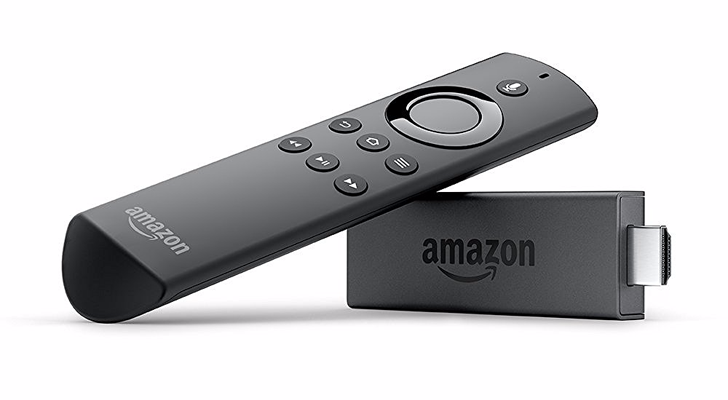 The all-new Fire TV Stick with Alexa Voice Remote is available for pre-order now in the UK and Germany, and will ship to customers starting in April. The latest generation Fire TV Stick with Voice Remote is available for pre-order now in Japan and will begin shipping to customers April 6.